Size: Up to approx 14" (35cm) for males and 10" (25cm) for females. Origin: Found in several areas of Lake Tanganyika, giving rise to a number of regional variants. Tank setup: A large tank (suggest 100 gallons/450 litres plus for a group), with plenty of open space. Large smooth rocks can be used to make caves (make sure they are secure! ), or alternatively, large ceramic or PVC pipes could be used. Compatibility: May eat smaller fish. 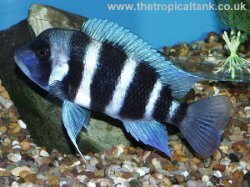 Best kept with other large fishes which can hold their own but are not overly aggressive. 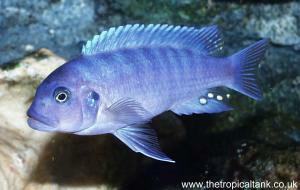 The open-water 'Haplochromines' from Lake Malawi are a good choice. Feeding: In the wild, these fish are primarily piscivores (fish eaters). In the aquarium, this can be provided for with baitfish such as whitebait, lance fish, silversides etc, and mussel, prawn/shrimp, etc. 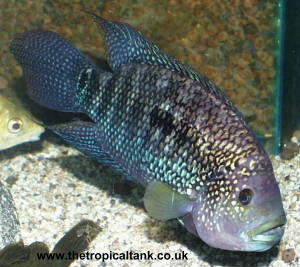 There is also a range of suitable cichlid sticks and pellets available. 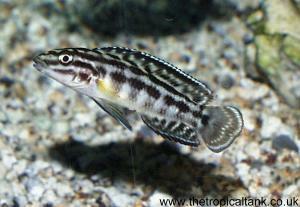 Sexing: Although there are several indicators of gender in Frontosa, they are not clear-cut. Males tend to have a larger nuchal hump on the forehead, but older females will also possess a hump. Males will tend to be larger and provide other clues via their behaviour. However, this will not be much help in initially selecting juveniles. An experienced breeder/dealer may be able/willing to 'vent' the fish, but do not expect reliable results from smaller juvenile fish! Breeding: Ideally, a breeding colony should be established with one male per 3-4 females. Other sub-dominant males will usually be tolerated in groups occupying a large tank. These fish mature slowly, so patience is required to establish a breeding colony - do not buy juvenile 'fronts' if you want a breeding project with quick results! 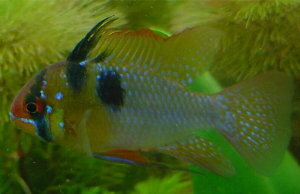 Spawning is not as dramatic or aggressive as many other cichlid species. The female mouthbroods the young for a relatively long time period, about five weeks. Fry should be removed and raised separately. 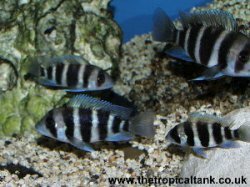 Comments: Adult Frontosa are a very impressive sight in a large aquarium. A number of the regional variants are highly desirable to enthusiasts, such as the 'Zaire blue' and 'Mpimbwe blue'.